Allow me to introduce my mod. Mod is nothing special, but it means a lot for trucks. The signs look good for many imaging of your favorite trucks. Schedule signs on trucks are set like real life. There is a possibility that bothers Mighty Griffin DLC and DAF Tuning Pack DLC, but then you do not have to set the signs, it is our choice what you want. Mod will be available on Modsfire. 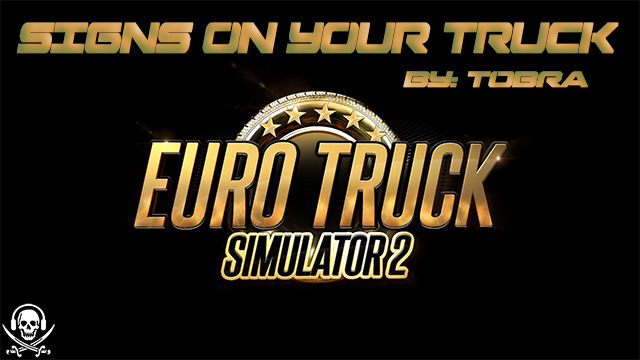 Cut (ctrl+x) or copy (ctrl+c) and paste (ctrl+V) file sign_for_tru.zip into your mod folder directory "C:\Users\user_name\Documents\Euro Truck Simulator 2\mod". Last edited by bratogo on 14 Apr 2019 13:50, edited 16 times in total. Mod is great, but every "green" plate is flying on Scania's grill. Do you use another mod? Can you show an image of the problem? I would ask you to place 'game.log' on pastebin. The mode is exclusively designed for standard trucks in the game! A trial version available on Steam. Ovo mi je jedan od najdražih modova!!! Volim da stavljam znakove za radijaciju, hemijske opasnosti i sl. na svoje kamione. This is one of my favorite mods!!! I love putting sings of radiation and chemical hazards, and etc. on my trucks. Last edited by bratogo on 11 Mar 2018 20:27, edited 1 time in total.